1) It has to be handheld. 2) It has to be tasty. 3) It has to get people talking. 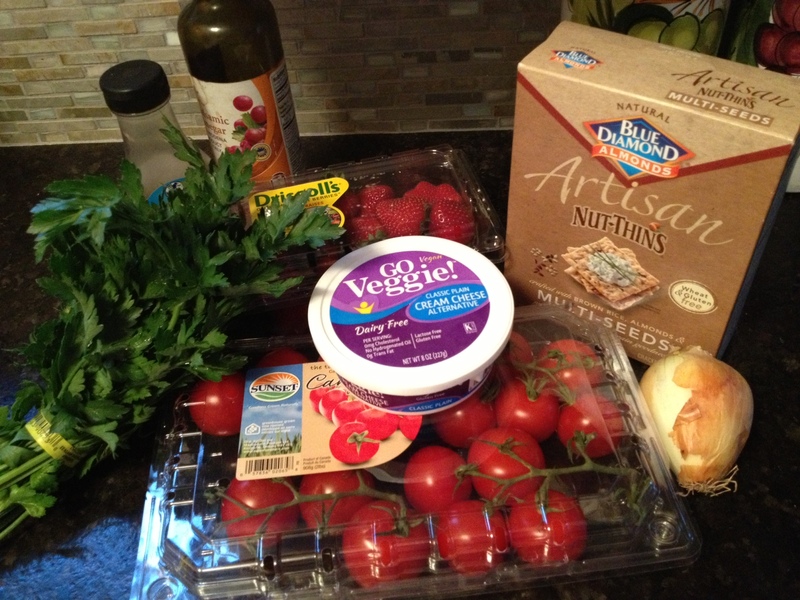 Just a few simple ingredients made for delicious gluten-free block party snacks! Products in hand, I proceeded to take a “Chopped!” approach and made my dishes using only the ingredients I could find in my kitchen. Since the whole point of the Summer Block Party is to help everyone feel more confident and included at food-centric social events, I decided to make my recipes not only gluten-free, but also vegetarian. First up, I created a spin on stuffed tomatoes. 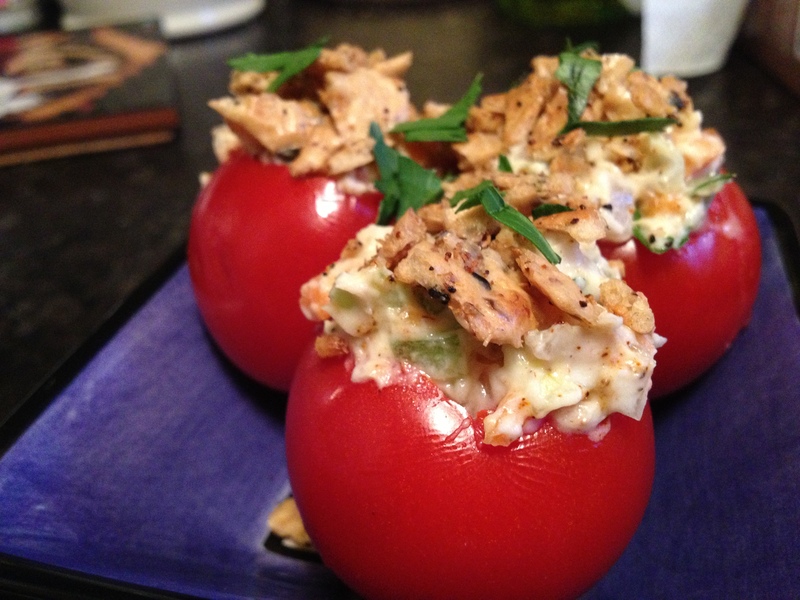 I have looked at a number of stuffed tomato recipes online, but never have tried them myself. Some call for baking the tomato, but for this batch, I left the oven off. Instead, I crumbled up the Artisan Nut Thins and toasted them in a pan, which added a nutty flavor and crunch to each bite. I’m not one for exact measures when creating recipes, so you’ll have to bear with me when I say just wing it on the amounts. Everyone has their preferred veggies-to-cream cheese ratio, and I tend to use more pepper than salt in my seasoning. So, customize it to your liking. For the sweet dish, I first tried blending strawberries with the Go Veggie! Cream Cheese Alternative. What I didn’t anticipate was that the water in the strawberries would thin the cream cheese out too much. 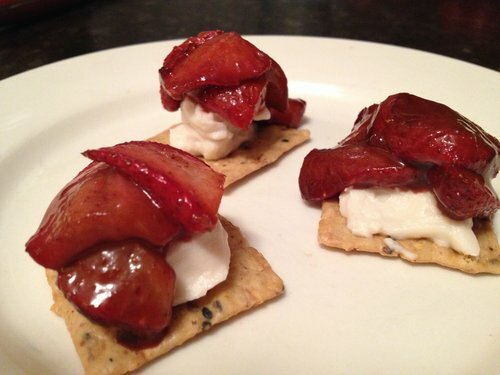 It was delicious, but didn’t have the heft that I was looking for in a cracker topping. My guess is that it would make a fantastic pie filling, especially if mixed with a gluten-free, dairy-free vanilla pudding. Chilling the mixture in the fridge also helps it set up. If you ask me, these recipes offer more interest than the standard chips, salsa and fruit salad, but I’m eager to hear what you think. Invite the neighbors over, give these recipes a whirl, and let us know how it goes!